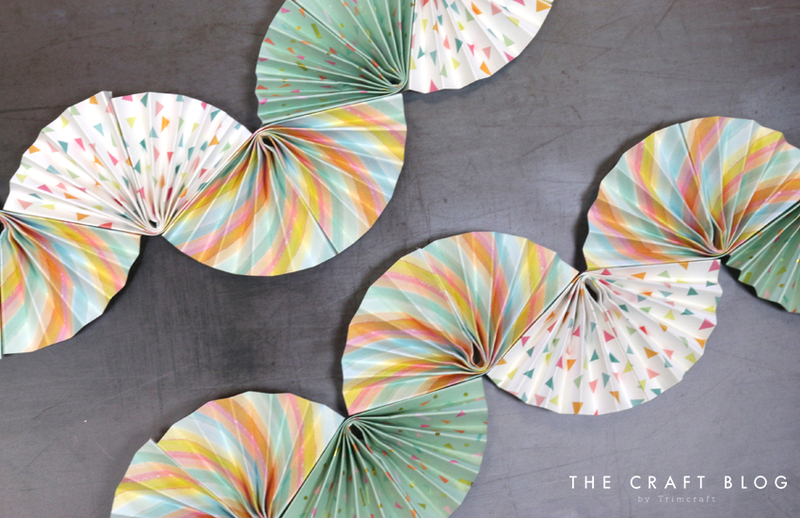 Brighten up any occasion by using your favourite papers to create your own Paper Fan Garland! Your garland is sure to make a big impression at any event – you can hang it on the walls, lay it across a table, or string it up at a party, for some simple yet super stylish décor! 1. Cut down a sheet of 12”x12” paper into 6”x6” squares. You can use 6”x6” paper but you might run out of the designs you wish to use quicker. 2. Score straight across the paper leaving half inch spaces between each score line. Continue scoring until you reach the end of the paper. 3. Start with a mountain fold and continue to valley and mountain fold the paper until you have a concertina. 4. Bunch the paper together then fold in the middle so the two outer sides meet. 5. Use hot glue to stick the shape together, hold it for a few seconds until the glue has set, this will ensure a stronger bond. 6. Repeat the steps above until you have enough fans to make your garland, for a 1.2metre garland we used 15 fans. We used 3 different papers to give a lovely contrast. 7. Use hot glue to stick your fans together, turn one of the fans upside down so the edges sit flush. Repeat this until your garland is the length you require. 8. Use a hole punch to attach some string or twine to the very end fans, this will help you to hang your beautiful garland. You now have your finished garland! We love how easy this is to create - so simple but SO stylish! You can use your favourite papers to create your own. Don't forget to share your versions with us by uploading them to the Inspiration area, or if you upload them to social media, please #Trimcraft so we can see!